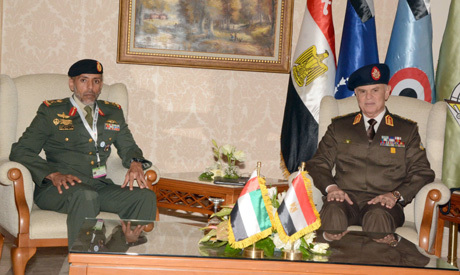 Egypt's military chief of staff held talks on Wednesday with African military and defence chiefs and a UAE official on the sidelines of the country's first defence expo, an Egyptian military statement said. Mohamed Farid Hegazy discussed military cooperation, joint training exercises and current developments on the African continent with Cameron's Defence Minister Joseph Beti, Malian Chief of Staff M'Bemba Moussa Keïta, and Rwanda’s Chief of Staff Patrick Nyamvumba. During the talks, the Egyptian military leader stressed that Cairo looks forward to furthering bilateral cooperation with these countries. Also on Wednesday, Hegazy met with the chairman of the UAE's National Service and Reserve Authority Sheikh Ahmed bin Tahnoon Al-Nahyan. The pair discussed Egyptian-Emirati cooperation, and future coordination to host global gatherings in Egypt and the UAE. The talks came on the sidelines of Egypt's first military and defence industries expo, EDEX 2018, which concludes on Wednesday. Egypt has said over 370 companies from 41 countries are taking part in the three-day exhibition to showcase their military and defence equipment.